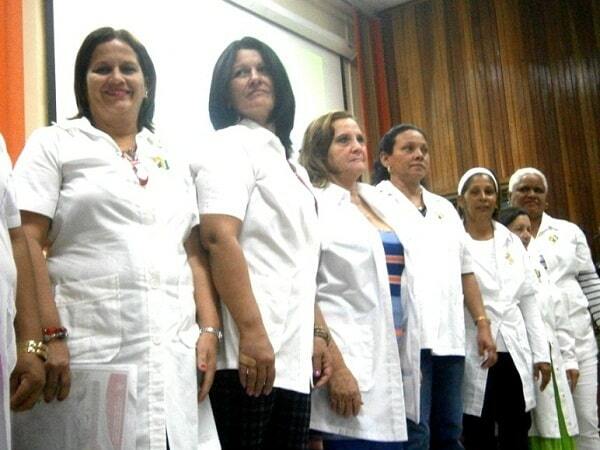 Healthcare workers from the Cuba's Ministry of Public Health celebrating their day. Photo: Mireya Ojeda. Don Fitz is a member of the National Committee of the Green Party USA and newsletter editor for the Green Party of St. Louis. During the 1960s, Cuban medicine experienced changes as tumultuous as the civil rights and antiwar protests in the United States.1 While activists, workers, and students in western Europe and the United States confronted existing institutions of capitalism and imperialism, Cuba faced the even greater challenge of building a new society. How did the policlínico integral differ from earlier policlínicos, and why was it so central to creating the new medicine? MINSAP’s plan addressed existing shortcomings by consolidating services. Staff at the new polyclinics would include at least a general practice physician, nurse, pediatrician, OB/GYN, and social worker.7 Dentistry was also brought under the umbrella, and nurses and social workers made house calls.8 Staff extended services to workplaces, schools, and communities. Outreach included health campaigns such as mass vaccination programs and efforts to control malaria and dengue. Clinic staff coordinated primary care programs (maternal and child care, adult medical care, and dentistry) as well as public health, including control of infectious diseases, environmental services, food safety, school health, and occupational and labor medicine.11 The policlínicos integrales were designed to integrate medical services in multiple ways. In addition to combining preventive and curative medicine, they provided a full range of services at a single location, coordinated community campaigns, and offered social as well as medical services. Most importantly, they provided a single point of entry into the system, allowing for a complete record of patients’ medical histories and making them key to the transformation of health care. It cannot be overemphasized that these advances in medical care could only have succeeded through the massive changes throughout Cuban society that began immediately after the revolution and continued during the ensuing decade. The best known was the literacy campaign of 1961, but other programs addressed racial discrimination, land reform, agricultural salaries, farming methods, improved diet, pensions, new roads, new classrooms, housing, piped water, and urban–rural differences. The redesign of medical services was thus hardly an isolated process – it was an essential component of remaking Cuba. Though the first plan for a comprehensive national health service was developed in 1961 and implemented the next year, it was significantly revised in 1965.16 The new version sought to alter the structure of the medical system itself, as MINSAP turned its attention to the unbalanced number, proportion, and location of medical facilities. Only around a fifth of Cubans lived in Havana, but the city had more than half of the country’s hospital beds. By comparison, the rural Oriente, the eastern part of the island, with a larger black population, was home to 35 percent of all Cubans but had only 15.5 percent of hospital beds.17 Thus, plans for new beds and doctors were concentrated in the east. The polyclinic took on a more central role, as more patients were initially seen at polyclinics, where a physician could refer them to a hospital. The number of health visits doubled between 1965 and 1969, but visits to hospitals dropped from 28 percent to 19 percent of the total. At the same time, trips to polyclinics went up from 32 percent to 63 percent of total medical visits. Clinics changed not only in number but in type. Mutualism, the prevailing model in Cuba for four centuries, was a pre-revolutionary holdover unable to resolve health issues with its scattered array of unconnected services. Nevertheless, it remained immensely popular. A key task of the revolutionary government was to resolve these contradictions. Mutualism broadly resembled insurance, with subscribers paying a monthly fee for hospitalization and medical services. The types of services covered varied widely from plan to plan, and none covered everything. Of 456 Cuban health institutions in 1956, 42.8 percent were private or mutualist.19 Often owned by rich doctors, these entities were a major barrier to an integrated medical system with facilities that could provide a complete range of services. Unlike the new policlínicos integrales, mutualist clinics did not offer preventive medicine, were not adequately linked to hospitals, and did not serve specific geographical areas. Nevertheless, given the popularity of mutualist clinics, the revolutionary government was wise not to nationalize them outright, as it did many large, foreign-owned businesses in the early 1960s.20 Instead, MINSAP created a task force in 1963 “to consolidate and rationalize mutualism.”21 In Havana, mutualist clinics were required to provide comprehensive services, and after 1967, the mutualism budget was included in the MINSAP budget.22 As mutualist clinics were required to provide services similar to those of government clinics and ceased to be separately funded, their distinct role was withering away. In 1970, mutualist plans stopped accepting new members and charging monthly dues, offering equalized services for members and non-members alike—and thereby ceased to exist. Private medical practice, while not prohibited, likewise faded away. While some authors suggest that private practice had ended by 1968 or 1969, Ross Danielson writes there were still eighty full-time private physicians on the island as late at 1970.23 By the early 1970s, Cuba had a unified medical system, with a focus on the polyclinic for care delivery and all services guided by MINSAP. Cuban planners carefully studied health systems in the Soviet Bloc, especially that of Czechoslovakia. These systems were often overcentralized, leaving little room for individual initiative by practitioners or local administrators. In response, Cuban officials developed the concept of “centralization/decentralization,” which aimed to address such risks by making the policlínico integral a unique institution of Cuban medicine. What may be difficult for non-Cubans to grasp is that decentralization increased alongside centralization. As mutualist clinics were drawn into the medical system, MINSAP opened new base clinics and expanded their decision-making power. While certain programs were under vertical control, such as those for tuberculosis, leprosy, and venereal disease, polyclinics were given broad discretion over their implementation, improving efficiency.27 In general, the period saw a process unifying and standardizing the rapidly expanding system of clinics while decentralizing clinic management and increasing autonomy. A subtle but important element of the elevation of the policlínico integral was the creation of primary care as a specialty, addressing everyday medical problems in clinics. Offering primary care as an option for postgraduate training put these physicians on par with other medical specialists as part of the core staff of policlínicos integrales. Policlínicos integrales thus became the unifying link in the structure and services of the new national medical system, which made clinics independent of hospital control and authorized them to determine how to enact guidelines, create their own specialists, and, very importantly, cover a specific geographic service area for which they became the entry point for all local patients. Yet nothing enhanced their stature more in the eyes of average Cubans or better solidified their position in the decentralization of health services than their role in coordinating health campaigns. The director of the local polyclinic was also the chair of the Area Health Commission, which included the CDRs and other mass organizations. Thus the polyclinic was simultaneously linked to hospitals by sharing physicians and to the community through its central role in coordinating health campaigns.48 Vicente Navarro observes that Latin American scholars often attribute inadequate medical care in poor countries to a simple lack of resources. But the first decade of the Cuban Revolution shows that when limited resources are distributed equitably, medical miracles can happen. Similarly, it seems “unlikely that a redistribution of resources would have occurred without substantial redistribution of the decision-making power.”49 The keys to Cuba’s medical revolution were (a) dedication and work by all health care professionals under (b) a well-guided structure, set forth by MINSAP with (c) decentralized implementation of health campaigns by policlínicos integrals, in coordination with mass organizations. Another concern was that the fusion of centralization and decentralization was often not as smooth as hoped. Even though many revolutionary doctors took positions in MINSAP or as administrators of medical facilities, conflicts still surfaced between those charged with recreating the medical system and those whose daily work focused on care delivery.53 Sometimes contention was based on policy. Physician Julio López recalls that “many doctors and administrators felt like polyclinics were for inferior doctors. This changed during 1965–1967. There had to be an overall change because many worked at the polyclinic because they were required to and not because they wanted to.”54 While the new ideology proclaimed the importance of preventive medicine, doctors and other clinicians often perceived health as the mere absence of disease. A change in attitudes did occur, largely through the education of the next generation of practitioners. Discord also arose regarding the role of health care professionals in determining policy. Doctors tend to be very autonomous, confident that their own method is the best. What happens when their approach diverges from official policy, the community, or their colleagues? There was widespread disagreement, for example, over parents who wished to “live-in” with a hospitalized child. Dr. Felipe Cárdenas described a father who had to walk three hours every day to see his son, who was hospitalized with gastroenteritis in Guantánamo province.55 Most doctors and nurses strongly opposed letting parents sleep in a child’s hospital room, fearing that they would be a nuisance. But Dr. Enzo Dueñas recalled his experience at Lenin Hospital in Holguín during a shortage of nurses: “We had to have mothers taking care of their children. Now, the mother is with the child in the hospital and is not upset.”56 Dr. Cárdenas agreed that “the mother is the person who knows the child best, such as when he last used the bathroom or vomited. She needs to be involved in the care.”57 When the government decided to implement the policy of live-in parents, it proved very popular and resulted in shorter hospital stays for children. In general, the government sided with parents and the community during such disputes. Despite these efforts, the country still faced a shortfall of doctors in 1969. 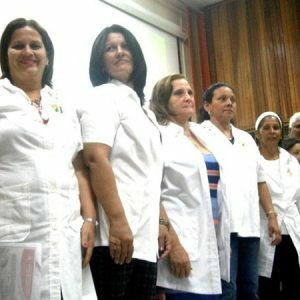 As Peter Bourne and others have acknowledged, “the departure of thousands of doctors severely hurt the ability in the short term to provide health care for all, a major commitment of the regime.”62 But could their absence simultaneously have enhanced Cuba’s ability to design its new medical system? I asked Cuban historian Hedelberto López how difficult it would have been to implement the changes of the 1960s, including the development of polyclinics, if the counterrevolutionary physicians had stayed. He replied that “of course, the revolution in medicine would have been impossible if doctors had not fled the country. They would have disrupted everything.”63 Julia Sweig agrees that concerns over potential interference shaped revolutionary leaders’ outlook: “Despite worries about losses of skilled professionals, Cuban authorities preferred that those who wanted no part of the revolution leave the island.”64 By the late 1960s, the departure of half of Cuba’s doctors to Miami thus proved a double-edged sword. One edge slashed into the health care of Cubans, depriving millions of desperately needed health care, even as the other edge cut off the ability of naysayers to obstruct the building of a new medical world. Navarro notes that by the end of the decade, the number of graduating physicians was greater than the number who had left the country.65 While true, this overlooks Cuban population growth during the 1960s.66 The issue is not merely the absolute number of doctors, but the ratio of doctors to patients. Table 1 (overleaf) combines Navarro’s figures for the number of doctors at the beginning and end of the decade, Roberto E. Capote Mir’s data for the number of medical students graduating annually, and data on Cuba’s annual population growth.67 To reconcile Navarro’s figures of 6,300 doctors in 1959, 3,000 annual departures, and 7,000 doctors in 1970, it is necessary to include an annual attrition rate of 1.98 percent (doctors who no longer practiced medicine due to death, retirement, or change of profession). a Estimated number of doctors at beginning of year. b Estimated number of doctors who left Cuba, based on 3,000 total departures. c Estimated attrition rate of doctors from death, retirement, or change of profession. Sources: Navarro, “Health, Health Services, and Health Planning in Cuba”; Capote Mir, La Evolución de los Servicios de Salud y la Estructura Socioeconómica en Cuba ; http://populstat.info. From these calculations, it appears that the 1959 ratio of .91 physicians per 1,000 people was probably not attained again until a few months into 1973. This differs a bit from Danielson’s estimate that the pre-revolutionary doctor/patient ratio was reached in 1972.68 But whichever date is used, Cuba’s medical coordinators were expecting a future decrease in the need for doctors. By the early 1970s, they were both preparing a quota to reduce the medical acceptance rate to 20 percent of all university applicants and encouraging medical students to transfer into other programs.69 This reflected the integration of divergent aspects of medicine as a system. By the end of the revolution’s first decade, the polyclínicos integrales had taken a qualitative leap from expanding access to medical attention to conceiving and implementing a novel approach to health care as a whole. Through their practice, the clinics showed it was possible to transcend the deficiencies of capitalist medicine and develop the collective consciousness required for a new system to take root. Many lessons of the first decade of Cuban medicine had been assumed or suspected before the revolution confirmed them. It became clear that medical care could only be improved if a country simultaneously addressed necessities such as food, housing, and education; medical campaigns must be based on mass participation; obstructive institutions such as mutualism could be overcome by creating a better method of care delivery before abolishing the old one; an institution could be improved by undertaking two contradictory processes simultaneously (such as centralizing and decentralizing medicine); and, despite the short-term damage of 3,000 doctors leaving, the long-term renovation of medicine was aided by their absence. These lessons laid the foundations for the unique Cuban network of clinics with defined geographic areas offering single points of patient entry into a system that combined preventive care with treatment. Through decentralized control of their own functions, the Cuban clinics quickly gained an equal footing with hospitals. As the 1970s began, unanswered questions remained. Could reallocation of resources continue to improve health even as Cuba remained poor and blockaded? Would the system of policlínicos integrales be able to reduce infant mortality? With the number of doctors per 1,000 Cubans approaching the pre-1959 ratio, would fewer students be admitted to medical school, or would unforeseen circumstances require a continued expansion of enrollment? Would policlínicos integrales continue as they existed during 1964–69, or would other structures and services replace or alter them? ↩The author thanks Candace Wolf for making her interview with Dr. José Gilberto Fleites Batista available; Hedelberto López Blanch for arranging interviews with Dr. Julio López Benítez, Dr. Felipe Cárdenas Gonzáles, and Dr. Ezno Dueñas Gómez; and Rebecca Fitz for interview translations. John Kirk, Linda M. Whiteford, and Steve Brouwer gave helpful comments on an earlier draft of this article. ↩Don Fitz, “The 3,000 Who Stayed,” Monthly Review 68, no. 1 (May 2016), 43–56. ↩Ross Danielson, Cuban Medicine (New Brunswick, NJ: Transaction, 1979). ↩John M. Kirk and Michael H. Erisman, Cuban Medical Internationalism: Origins, Evolution and Goals (New York: Palgrave Macmillan, 2009); Linda M. Whiteford and Lawrence G. Branch, Primary Health Care in Cuba: The Other Revolution (Lanham, MD: Rowman and Littlefield, 2008); Candace Wolf, “The Zen of Healing: Two Surgeons Speak, Spoken Histories of Dr. José Gilberto Fleites Batista and Dr. Gilberto Fleites Gonzalez,” Havana, Cuba, January 2013 (unpublished manuscript). ↩Danielson, Cuban Medicine , 163, 180. ↩Whiteford and Branch, Primary Health Care in Cuba , 20. ↩Vicente Navarro, “Health, Health Services, and Health Planning in Cuba,” International Journal of Health Services 2, no. 3 (1972), 410. ↩Navarro, “Health Planning in Cuba,” 426. ↩Ruíz, Cuba, Revolución Social y Salud Pública , 88. ↩Danielson, Cuban Medicine , 170. ↩Ruíz, Cuba, Revolución Social y Salud Pública , 61. ↩Navarro, “Health Planning in Cuba,” 414. ↩Navarro, “Health Planning in Cuba,” 415. ↩Danielson, Cuban Medicine , 143. ↩Navarro, “Health Planning in Cuba,” 412. ↩Navarro, “Health Planning in Cuba,” 411; Danielson, Cuban Medicine , 164. ↩Ruíz, Cuba, Revolución Social y Salud Pública , 11. ↩Julia E. Sweig, Cuba: What Everyone Needs to Know (New York: Oxford University Press, 2009), 45. ↩Roberto E. Capote Mir, La Evolución de los Servicios de Salud y la Estructura Socioeconómica en Cuba , 2a Parte: Periódo Posrevolucionario (Havana: Instituto de Desarollo de la Salud, 1979), 41; Ruíz, Cuba, Revolución Social y Salud Pública , 48; Danielson, Cuban Medicine , 164. ↩Ruíz, Cuba, Revolución Social y Salud Pública , 29. ↩Ruíz, Cuba, Revolución Social y Salud Pública , 62. ↩Danielson, Cuban Medicine , 166-7. ↩Ruíz, Cuba, Revolución Social y Salud Pública , 43, 56–57. ↩Dr. María Luísa Lima Beltrán, interview with the author, Havana, December 23, 2013. ↩Dr. Julio López Benítez, interview with the author, Havana, December 26, 2013. ↩Danielson, Cuban Medicine , 169. ↩Navarro, “Health Planning in Cuba,” 424. ↩Dr. Oscar Mena Hector, interview with the author, Havana, December 21, 2013 and January 1, 2014. ↩Danielson, Cuban Medicine , 165. ↩Navarro, “Health Planning in Cuba,” 409. ↩Navarro, “Health Planning in Cuba,” 408. ↩Navarro, “Health Planning in Cuba,” 428. ↩Danielson, Cuban Medicine , 147. ↩Ruíz, Cuba, Revolución Social y Salud Pública , 40. ↩Ruíz, Cuba, Revolución Social y Salud Pública , 59–60. ↩Ruíz, Cuba, Revolución Social y Salud Pública , 52–53. ↩Danielson, Cuban Medicine , 171. ↩Navarro, “Health Planning in Cuba,” 424; Danielson, Cuban Medicine , 173. ↩Danielson, Cuban Medicine , 172–73. ↩Danielson, Cuban Medicine , 173. ↩Danielson, Cuban Medicine , 175. ↩Navarro, “Health Planning in Cuba,” 431. ↩Berta L. Castro Pacheco et al., Cuban Experience in Child Health Care: 1959–2006 (Havana: Ministry of Public Health, 2010). ↩Whiteford and Branch, Primary Health Care in Cuba , 54. ↩Danielson, Cuban Medicine , 144. ↩Hedelberto López Blanch, Historias Secretas de Médicos Cubanos (Havana: Centro Cultural de la Torriente Brau, 2005), 4. ↩López, interview with the author; Navarro, “Health Planning in Cuba,” 429. ↩Dr. Felipe Cárdenas Gonzáles, interview with the author, Havana, December 26, 2013. ↩Dr. Enzo Dueñas Gómez, interview with the author, Havana, December 26, 2013. ↩Cárdenas, interview with the author. ↩Navarro, “Health Planning in Cuba,” 413. ↩Navarro, “Health Planning in Cuba,” 419. ↩Lima, interview with the author. ↩Peter G. Bourne, Fidel: A Biography of Fidel Castro (New York: Dodd, Mead, 1986), 196. ↩Hedelberto López Blanch, interview with the author, Havana, January 10, 2017. ↩“Cuba: Historical Demographical Data of the Whole Country,” http://populstat.info, accessed June 15, 2017. ↩Danielson, Cuban Medicine , 232. ↩Navarro, “Health Planning in Cuba,” 414, 419.